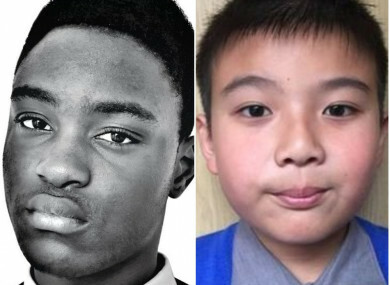 Two boys Nonso Muojeke and Eric Zhi Ying Mei Xue have come under the media spotlight over deportation orders in recent weeks. 14-year-old Nonso Muojeke and 9-year-old Eric Zhi Ying Xue. IN RECENT WEEKS the cases of two immigrant children facing deportation have come under the media spotlight across Ireland. The two boys Nonso Muojeke and Eric Zhi Ying Mei Xue have grown up here, joined schools and become part of their respective communities. Eric was born in Ireland, while Nonso’s family have been living here for more than a decade. Opponents to the 2004 referendum say they predicted that cases like these would occur in the wake of the vote. The referendum removed the automatic right to citizenship from children who are born here, unless their parents are themselves citizens. However they agree that another referendum is not needed in order for the issue to be addressed. Nonso Muojeke’s family hails from Nigeria. He is 14 and has lived in Ireland along with his mother and older brother since he was two years old. The family fled their homeland after his father died in 2007. The family’s claim for asylum was rejected and deportation orders were issued for the three of them. Nonso’s mother had appealed the decision and had been embroiled in a legal battle with the state for the last number of years. This summer, when it looked like Nonso and his family would have to leave, his classmates at Tullamore College in county Offaly launched a campaign to keep him in Ireland. Their efforts proved successful and last week Minister for Justice Charlie Flanagan confirmed Nonso, his mother and brother had been granted leave to remain in Ireland. They can now live and work legally here. In the days that followed St Cronan’s National School in Bray, county Wicklow, highlighted the case of a 4th class pupil there, Eric Zhi Ying Mei Xue. Eric is nine years old, was born in Dublin and has never left the country. However it’s understood his mother does not have legal status here. Deportation orders have been issued for them both, meaning Eric could be ‘returned’ to China, his mother’s country of birth, but a land he has no experience of. In his case he is legally stateless as he is neither and Irish or Chinese citizenship. His school has launched an online petition calling on Minister Charlie Flanagan to grant the pair leave to remain in Ireland under humanitarian grounds. At the time of writing the petition has gained over 40,000 signatures. Under the 2004 referendum, Eric does not have an automatic right to citizenship as his parents do not have citizenship status. The cases of both of these boys highlights the impact of the 2004 vote in which 79% of the population voted to amend the Irish constitution, say opponents of that decision. The issue however dates back slightly earlier, to the Good Friday Agreement. The 1998 deal allows people born on this island the right to claim citizenship. The agreement was intended to allow people in Northern Ireland citizenship of the Republic, if their chose to claim it. However it also allowed children of citizens of other countries claim the same rights. It wasn’t until 2004 that this issue became a political hot potato. File Photo: Tanaiste Mary Harney and Taoiseach Bertie Ahern look for the E in yes at a photocall with Government Chief Whip TD Mary Hanafin before canvassing on Grafton Street in Dublin. Source: Photocall Ireland! The Government of the day was composed of Fianna Fáil and the Progressive Democrats, led by an Taoiseach Bertie Ahern and Minister for Justice Michael McDowell. In what became a divisive campaign, those behind it claimed immigrants from outside of Europe were deliberately coming into Ireland in the latter stages of pregnancy, in order to have children who were EU citizens. The Greens, the Labour party and Sinn Féin opposed the referendum at the time. Labour senator and constitutional lawyer Ivana Bacik was part of the campaign in 2004. We could see this exactly this happening. Children born and raised here with no right to stay. Bacik said the referendum enforced a “prohibition on automatic birthright of citizenship”. We are not a country that has ever experienced a massive surge of inward migration. There was no evidence to support it (the referendum) it was all anecdotal evidence suggesting there was a problem. It seems very cruel to deport a child to a country which he has no relationship with. The Immigrant Council of Ireland told TheJournal.ie it believes there are “hundreds and hundreds of children in a similar situation to the two boys”. The group’s Colin Lenihan said they would “often get phone calls from immigrants who have received deportation orders and don’t know what to do about their children who have been born and raised here”. These kids are being returned to countries they have never been to. Lenihan said the council wants to see a fairer and more transparent immigration service created. We don’t need to repeal the amendment to give children born here in the state citizenship rights, we just need legislative changes, Lenihan said. Bacik pointed out that the amendment specifically gives legislators the ability of changing the law. That’s where we need to focus our efforts now, we could legislate to provide new ways to achieve citizenship and we should. TheJournal.ie has asked the Department of Justice how many children are facing deportation and how many have been deported in the last five years. A response was not available at the time of writing. Email “'We could see this happening': Why a 2004 referendum is linked to child deportations”. Feedback on “'We could see this happening': Why a 2004 referendum is linked to child deportations”.